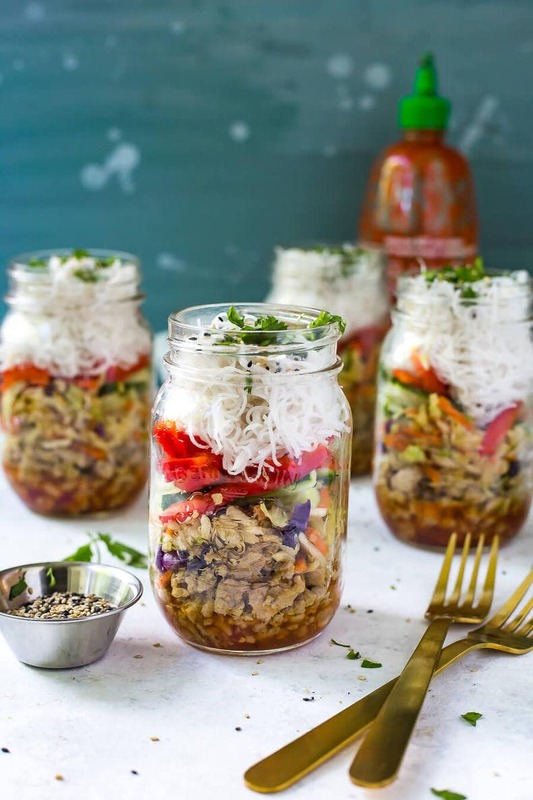 These Quick & Easy Chicken Spring Roll Jars are the perfect grab and go lunch. 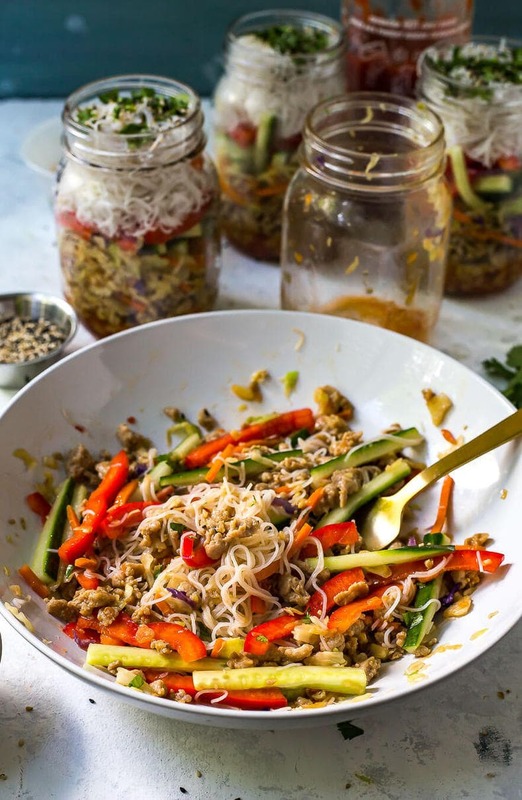 Assemble the noodles, ground chicken & veggies ahead of time and add a little sweet chili sauce for some kick! I swear my day is filled up with thoughts of food all day long. I really look forward to lunch and dinner because they're pretty much the only two times I take a break during the day to relax for a bit. When I have a nutritious lunch that's also jam packed with flavour, it just puts me in a good mood for the day. Tell me I'm not the only one who thinks like this! There's just something about looking forward to lunch that powers you through the morning – it even gives me a little bit of incentive to wake up some mornings. If you're looking to switch up your weekly lunch prep, I urge you to try these Quick & Easy Chicken Spring Roll Jars. 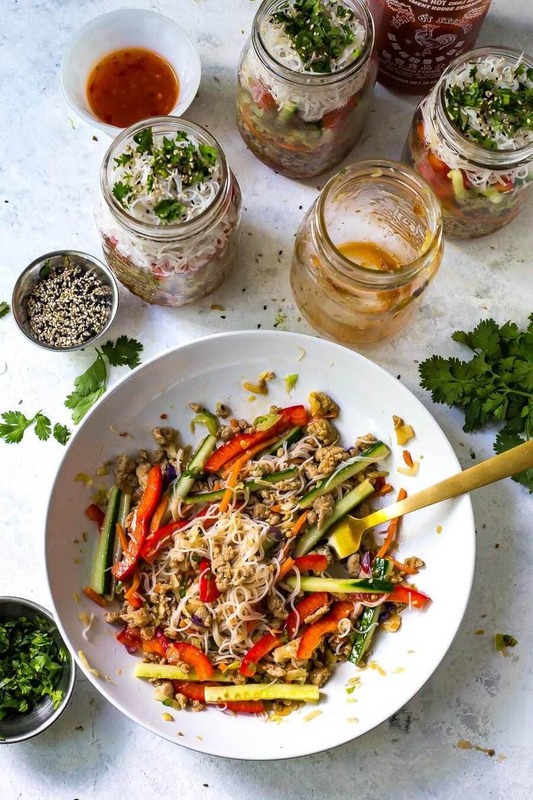 They're kind of like a mix between a deconstructed spring roll bowl and a mason jar salad, and you can layer the ingredients all at once and they'll last in the fridge all week long. 30-40 minutes of food prep on the weekend seriously saves me during the work week. There's nothing worse than rummaging through the fridge looking for something to eat at the last minute or realizing that you've forgotten to pack your lunch. These Chicken Spring Roll Jars are filled with a bunch of super simple ingredients, and you can switch it up to use whatever's lying around in the fridge, as with most of my recipes. 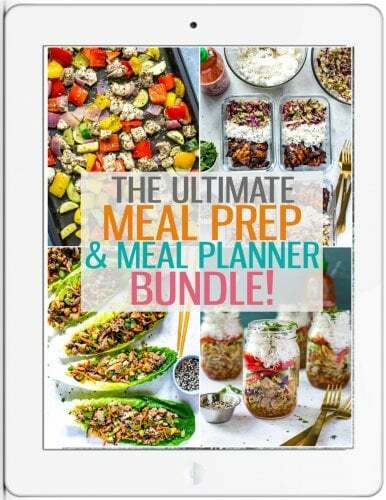 I really believe that just about any veggie works when it comes to effective meal prepping. I kind of take a clean-out-the-vegetable-crisper approach each week. As long as you make sure to get the proper protein, this method really works! 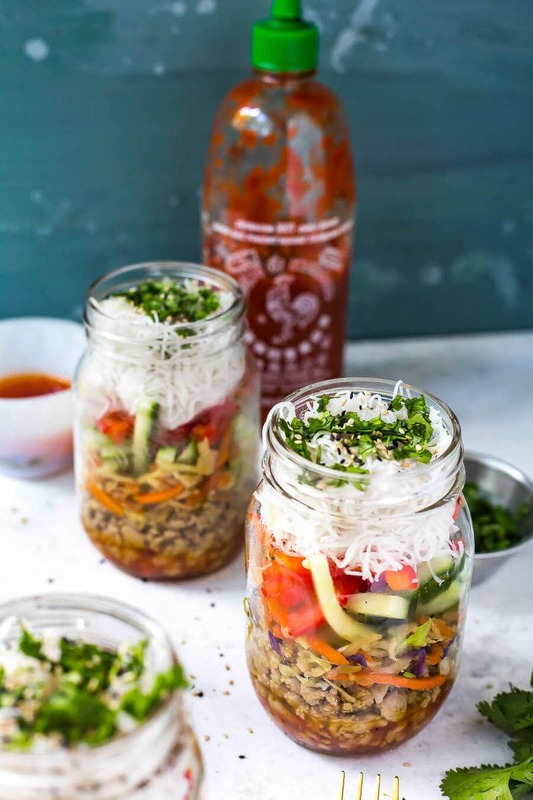 The sauces in these Chicken Spring Roll Jars are also relatively simple – you don't need much to pack a ton of flavour in here! I've been so obsessed with sweet chili Thai sauce lately that I've recently gone through one of those giant Costco-sized bottles. I seriously find just about every excuse to use it! If you don't have any on hand though, you could use some jarred sweet and sour or plum sauce in these jars and just load up on other natural flavours like fresh cilantro, mint and basil, along with sriracha and soy sauce. Make sure to add the sauce in at the bottom of the jars (the handy video above will help show you how it's done!) and then add in your ground chicken (cooked with sesame oil, soy sauce, garlic and ginger), sauteed coleslaw mix, fresh cucumber and red pepper, then your vermicelli noodles and fresh herbs. The process really couldn't be easier. And did you know that vermicelli noodles are gluten-free? 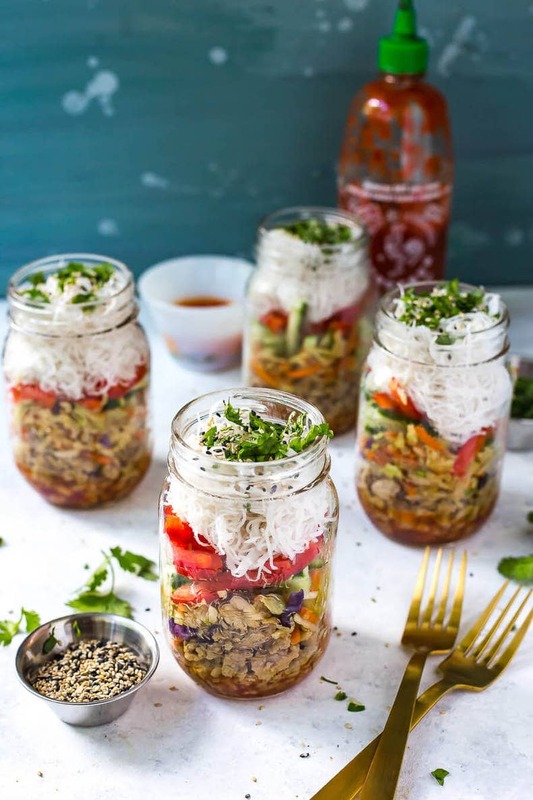 Most are made from rice, so you can feel good about adding in a light carb to these Chicken Spring Roll Jars. 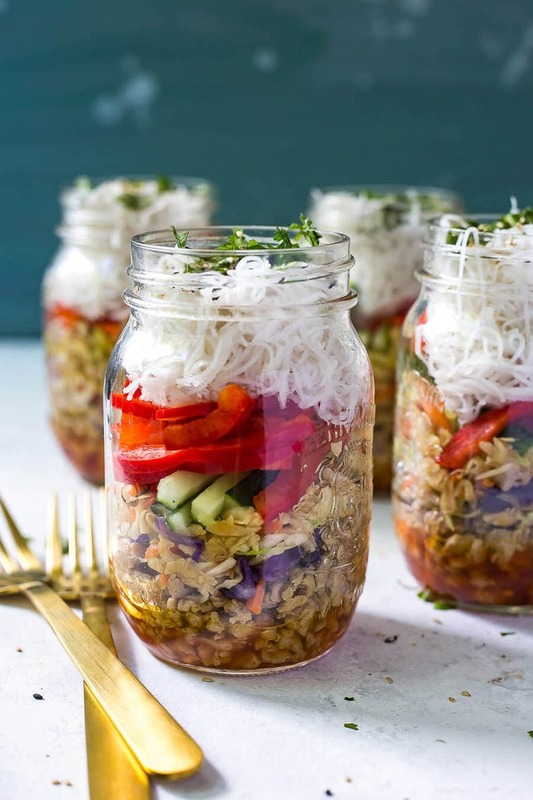 If you're looking to make these jars even lower carb, you could always add in more coleslaw or even some chopped kale or quinoa – there's no limit to the ways you can customize this super healthy lunch idea! Will you be making these Quick & Easy Chicken Spring Roll Jars? I'm obsessed with all the flavours and textures going on here. If I could pack these everyday for lunch I think I would…Just prepare for these jars to be stolen out of the lunch fridge at work. I'm serious. You'll want to keep count. This is my fave sweet chili sauce. I also use these mason jars – they're so perfect for meal prep! Heat sesame oil over med-high heat in a large skillet. Add ground chicken and 2 tbsp soy sauce, cooking for 2-3 min. Add garlic and ginger, then sautee for 7-8 min until chicken is fully cooked. Remove chicken from pan and add coleslaw and 2 tsp soy sauce, sauteeing for 2-3 min until slaw is slightly wilted. Meanwhile, cook vermicelli noodles according to package directions (usually takes 2-3 min in boiling water). Add sweet chili sauce to 4 medium-sized mason jars (I believe I use the 12oz ones that are larger than the jam jars but not quite as large as regular mason jars). Divide chicken among jars, then coleslaw, cucumber and red pepper. Top with vermicelli noodles, fresh herbs and sesame seeds. Add soy sauce and sriracha if desired. Jars keep in fridge up to 5 days. I love this idea for a healthy grab-and-go lunch! Thanks so much Marguerite!!! So glad you liked it! I tried the noodles, meat, sauce and coleslaw warm today, with the veggies and herbs cold. Everything was delicious! I get negative points on presentation since I don’t have Mason jars but I’m making this today and hoping it goes well! How is this almost 500 calories for a serving? Seems high for those ingredients. 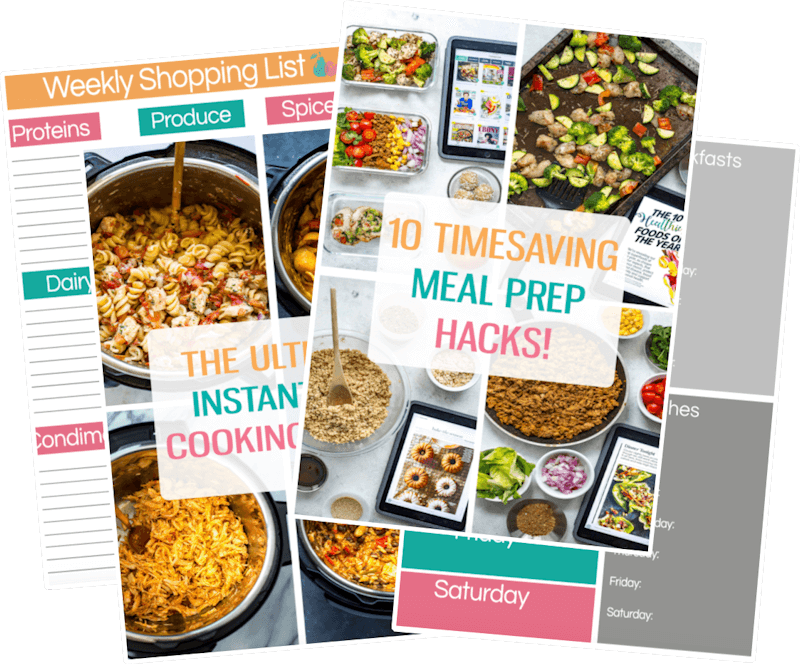 Hey Laurie – I use a nutrition calculator which gives a best estimate. If I were to guess, the combo of chicken, noodles and sauce gives this calculation. If you are looking to lose weight/maintain weight, you want to be eating between 300-500 calories per meal and 100-200 calories per snack so these jars fall right in line with a healthy lifestyle. If you are still unsure about the nutritional facts you can recalculate using an app like My Fitness Pal.